Surrounded By Military Barracks, Skiers Shred The Himalayan Slopes Of Indian Kashmir Kashmir, disputed between India and Pakistan, is the site of a decades-long insurgency. It is also a winter sports haven. During recent airstrikes and shelling, a ski station remained open. In a Himalayan valley surrounded by military barracks, blasts of artillery fire often reverberate across the icy mountain peaks. This is one of the world's longest-running conflict zones. It's near where India and Pakistan recently traded airstrikes. So it's not unusual to see helicopters buzzing overhead. But on a morning in early February, one particular chopper was not part of the conflict. "I run Kashmir Heliski. We have clients from different parts of the world. We take people to 4,500 meters. They enjoy it!" says Billa Majeed Bakshi, a local skier turned businessman. Since 2011, Bakshi has ferried more than 1,000 skiers and snowboarders nearly 15,000 feet up into the Himalayas, via helicopter, in Indian-administered Kashmir. Kashmir is split between Indian and Pakistani control. The mountain valley is the site of a decades-long insurgency, as separatists on the Indian side fight for independence. Hundreds of thousands of soldiers are stationed on either side of the Line of Control, Kashmir's de facto border. Pakistan-based militant groups have claimed responsibility for attacks on Indian security forces, including a Feb. 14 suicide car bombing on the valley's main highway. 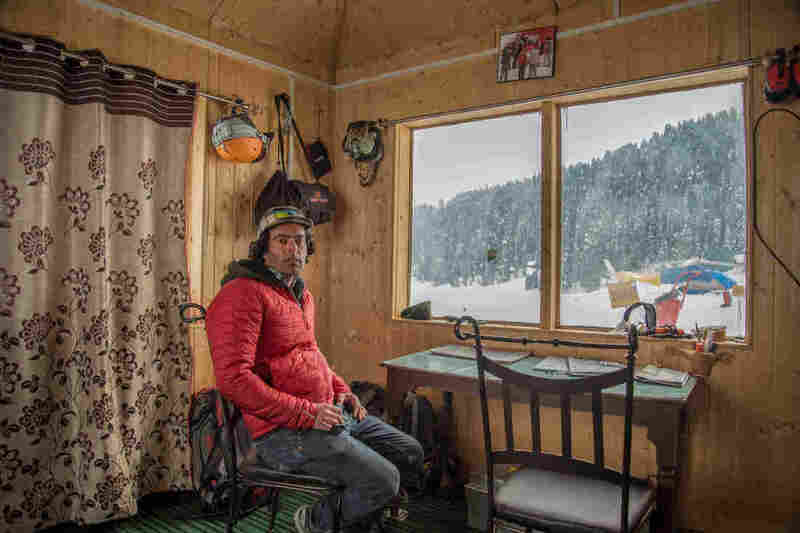 Billa Majeed Bakshi, the founder of Kashmir Heliski, has ferried skiers and snowboarders nearly 15,000 feet up into the Himalayas via helicopter in Indian-administered Kashmir since 2011. But in the cold months, when the valley fills with snow, it also becomes a winter sports haven for a small but devoted gang of extreme sports enthusiasts. 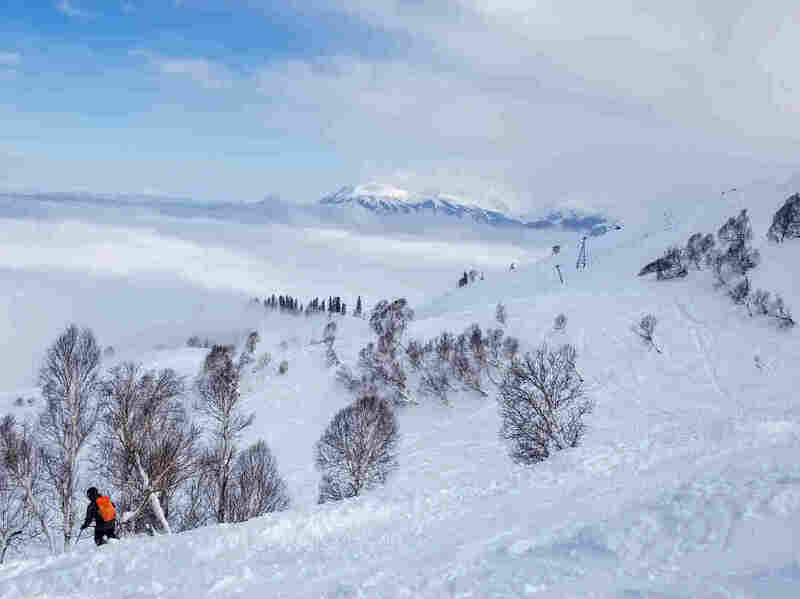 They often ski — "shred lines," as boarders and ski bums put it — just a few hundred yards from the Line of Control, within view of Pakistani troops on the other side. "I think it's fantastic! I just wish we could get over their mountain ranges and shred with them too," says Jimmy Hands, 41, who's visiting from Toronto. "Look, nothing brings peace like a little bit of snow, and everybody's been magical here! Like, it is magic." The powder this high up may be magical — but it also leads to avalanches. In early February, at least nine people died in avalanches triggered by a single snowstorm. "Someone who's had an accident, whether it's a fall on ice or they're involved in an avalanche, to move that person to a hospital — that is a big challenge here, without the infrastructure of other countries," says Brian Newman, a Coloradan who serves as the snow safety officer for the Gulmarg Ski Resort, a Kashmiri state government-run resort with two giant gondola lifts. During the recent Indian and Pakistani airstrikes and shelling over the Line of Control, the ski station at Gulmarg remained open for business. The main Jammu-Srinagar highway, the only route connecting Kashmir to the rest of India, is often impassable for several days at a time because of snow. At the area's main airport, flights regularly get canceled due to foul weather. Snowplows are in short supply. Skiers line up at the only chairlift in Gulmarg, a resort in Indian-administered Kashmir. Until the 1990s, Gulmarg, with fewer than 2,000 residents, was a sleepy hill station. The area, the Pir Panjal Range of the western Himalayas, was a summertime playground for India's British colonial rulers, who came to escape the sweltering heat farther south. There's still a British-built golf course. Synonymous with romance and revolution, Kashmir has always captured the Indian imagination. Bollywood song sequences have long been filmed there. 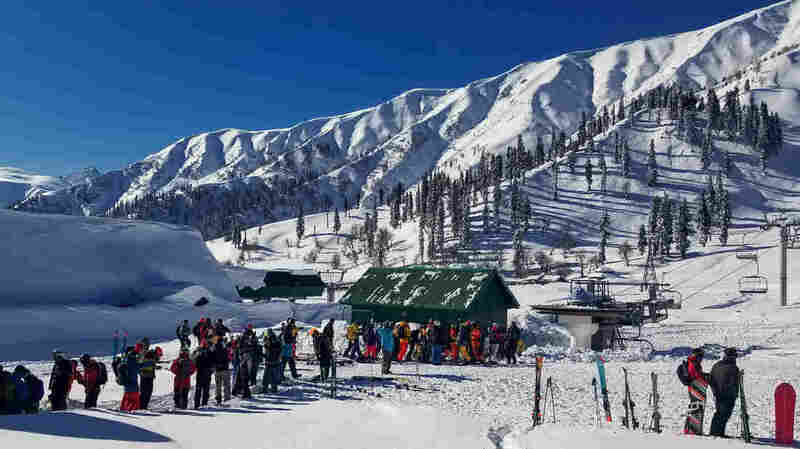 But after the state government built two gondolas in 1998 and 2005, Gulmarg began attracting more tourists from abroad, and increasingly from India too. In 2007, the government hired Newman. He obtained explosives from the Indian military to blast off excess snow that might otherwise avalanche and imposed rules requiring skiers to carry avalanche beacons, shovels and probes. He even learned the Kashmiri language. As India's middle class grows, domestic tourists have been coming to Gulmarg in greater numbers. The state government says 800,000 Indian tourists visited Kashmir in 2018, along with 50,000 foreigners. 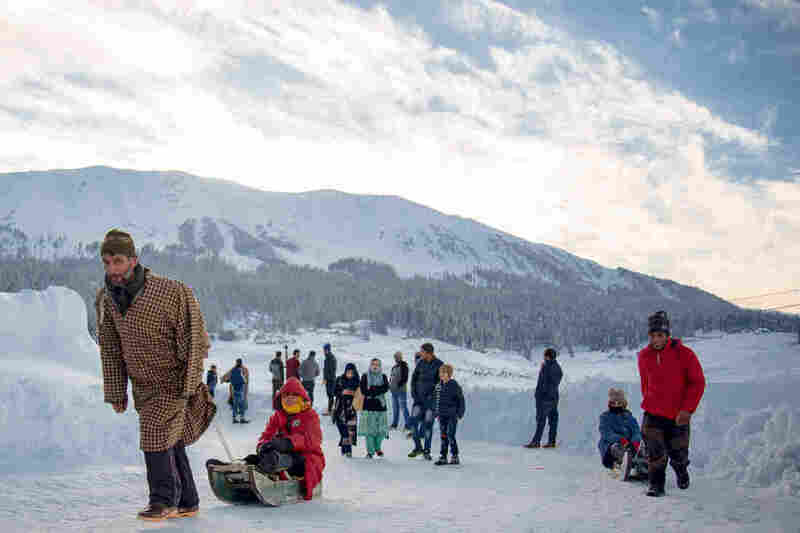 There are traffic jams every Sunday afternoon, as day trippers, having paid about $5.25 for a scenic ride up the first gondola, exit the resort and drive back to Srinagar, the biggest city in the Indian state of Jammu and Kashmir, about 30 miles away. "It's almost like a different world! You're cocooned in this space between the sky and the snow," says Nikita Kapoor, 29, visiting for a long weekend from Kolkata — where it never snows. "I'm learning how to snowboard for the first time, so it's really exciting!" 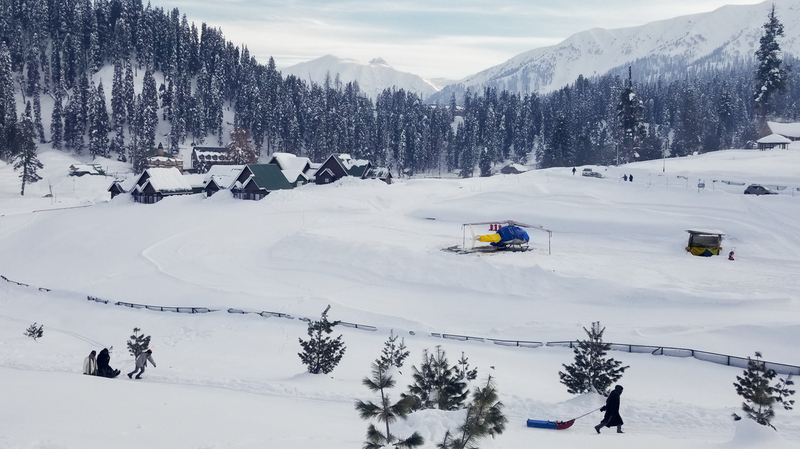 As India's middle class grows, more domestic tourists are coming to Gulmarg, a resort in Indian-administered Kashmir that used to be a playground for British colonial rulers in the 19th and early 20th centuries. Tourists like Kapoor don't seem fazed that their holiday destination is home to a decades-long separatist insurgency that, by some measures, is growing. Clashes between protesters and security forces have resulted in an estimated 40,000 to 70,000 deaths and thousands of injuries in the past three decades. Indian troops are accused of firing live ammunition on civilians, including deliberately targeting people's eyes. Still, tourism brings much needed revenue — as much as 8 percent of the state's gross domestic product — which dips dramatically whenever there's violence. The local unemployment rate, 21 percent, is about triple that of the rest of India. What kind of jobs are there in Kashmir, beyond this ski resort? "Nothing!" says ski guide Altaf Khanday, shaking his head. "You know the guys who are [throwing] stones in the valley? They are well-educated guys. Even they are busy in the militancy. It's so sad." For Khanday, becoming an expert skier was an economic decision. 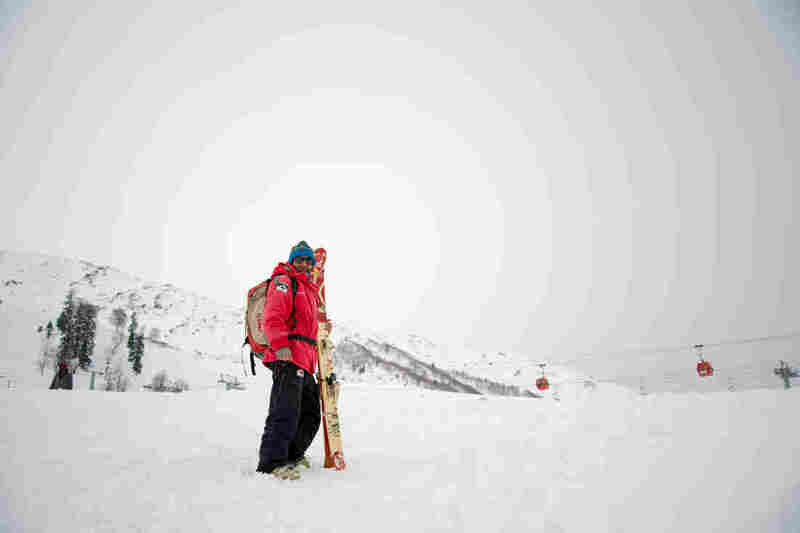 Now, at age 30 and working as a back-country ski guide for the two-month ski season, he's able to support seven members of his extended family all year. Altaf Khanday, 30, works as a back-country ski guide in Gulmarg for two months a year. His earnings allow him to support seven members of his family all year. He learned to ski with secondhand gear. Lots of ski shops in Gulmarg rent gear donated by foreign visitors when they leave. It's common to see Kashmiri youth learning to ski on straight, long, old-fashioned skis from the 1980s and 1990s. "Oh my gosh, my first ski boots, they didn't even have buckles!" Khanday says, laughing. "You know what skis I had? Broken ones!" Not far from the ski lifts, young men huddle around a wood stove in a mountain hut in a forest. Tourists can rent dormitory rooms in the hut for about $14 a night, including breakfast. One of the men, Raja Wasim Khan, 24, says his father moved the family to Gulmarg in 2010, when he was a teenager. "Actually, he was a terrorist. He fought for Kashmir. For five or six years, he was in jail," says Khan. "Then he started a new life, and he taught us snowboarding." 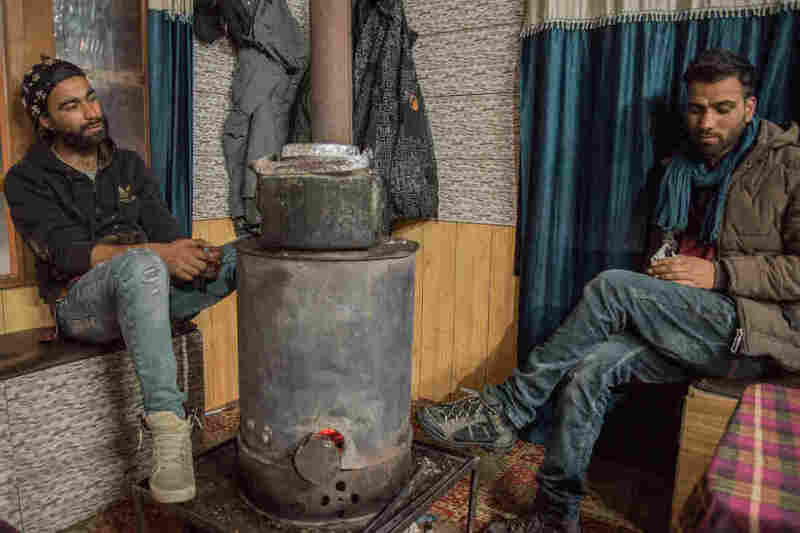 Raja Wasim Khan (left), 24, and his brother Ashraf Khan, 21, huddle around a wood stove inside the ski hut they manage in Gulmarg. The Khan brothers' father was a Kashmiri militant who served time in an Indian prison and then moved his sons to the mountains and taught them snowboarding. He wanted to keep them away from the violence he grew up in. Khan says his father, Parvez Ahmed Khan, 52, a notorious Kashmiri militant also known as "the Tiger," wanted him and his brother to pour their energy into snowboarding rather than violence. Militant groups in Kashmir often recruit from the ranks of poor, unemployed and disaffected teenage boys. A gondola ferries skiers in Gulmarg. "Sometimes, if I'm so angry, I have to take my snowboard and go for a ride — to make myself relax," Khan says. "When you put your straps on and go for powder run, it makes you [feel] like you are flying! You didn't think about anything. You are just flying in the air." It's a welcome distraction from Kashmir's conflict, he says — if only for two months a year. NPR producer Furkan Latif Khan contributed to this report.